When we went to vote at the neighborhood middle school in November, we saw signs for an upcoming performance of Hamlet. After inquiring, we were invited to attend to a day-time performance attended by Columbus City School students from a few nearby schools. Cora was excited to see kids, just a bit older than her, acting out the parts. This version was set in the 21st century, and rather than 14th century Denmark, the location was a video game company. The students used various digital technology to share behind-the-scenes memories – prerecorded videos – and conversations – text message screenshots – between the characters to expand the story they acted out. In the meantime, Cora got a new book for Christmas; a collection of Shakespeare’s plays, condensed into short stories by Angela McAllister and illustrated with gorgeous paper collages by Alice Lindstrom. Similar in style to Eric Carle but far more detailed, we have been enjoying examining the images and Cora has excitedly shared them with interested friends who come over. This week I found her elbow deep in buckets of Playmobil figures (which she hadn’t touched in months), making characters she could use to act out Shakespearean plot lines. This is the kind of independent, playful learning I dream about as a homeschooling mom who aspires to authentic, creative education. Romeo and Juliet (bottom left) meet at the Capulet’s masquerade party. The audience of school kids on a field trip are delighted by the performance. Tomorrow we’re visiting The Columbus Civic Theater for The Complete Works of William Shakespeare (Abridged). This is one of those times when I’m so happy to be homeschooling. I never studied Shakespeare much myself, so reading the stories with Cora I’ve been introduced to cultural touchstones I see referenced elsewhere and have new understanding of. I’m looking forward to the play as much as she is since this theater is just a mile from our house and I’m ashamed to say I haven’t been there since they opened in ten years ago. One of Cora’s friends who is also currently hooked on Shakespeare is joining us for the performance. They are going to hang out after and you can bet I’ll be close by, seeing how the play winds its way into theirs. It’s hard to be indoors this time of year. We spend so much time in the yard and garden from early spring to late fall I really feel trapped by the cold. This year I’ve made a commitment to getting out for a bit with Cora each day regardless of the weather. I’m meeting mixed results. The chickens help as she misses them as much as the swings. But overall we’re pretty disconnected from the natural world at this time of year. We are growing all we can on the windowsills. The chia Gnome is sprouting his beard and potatoes are growing roots in glasses of water. For Christmas, we potted paperwhites for Cora to pass around as gifts. It’s been fun to these people’s homes and see the flowers growing taller and budding. Cora has been eagerly waiting for our flowers. The other day I bumped into the tallest of the bunch and knocked off the largest bud. I was so pissed at myself but quickly realized the teachable moment this would give us to look inside the bud – if you’ve ever grown paperwhites you know the buds push out of their leaf cocoons to such a great extent that you can see the shape of them bulging. It was fun to cut that pod open and take out the guts. Cora chopped the stem, stuck it with a toothpick, and opened the flowers by hand. I’m teaching a course on the history of art education this term. We always start with Frederich Froebel’s vision of kindergarten. I think he would have approved of this hands- and minds-on discovery time. What are you doing to stay connected to the natural world this winter? I’m not going to write about my own picturebook experiences tonight. Instead, I’m going to let a soon-to-be alumna of the University of Florida’s Masters in Art Education program do the work for me. Kaitlin Gallagher Pozzo is lives in the Minneapolis, Minnesota metropolitan area where she teaches art and Italian to homeschooled toddlers and preschoolers and is a Curiosity Center volunteer at the Minnesota Children’s Museum. For her capstone project, she examined various picturebooks about art, created and tested related lesson plans with her 3-year old daughter and a few of her homeschool tutees. The boys moved away before the study was over so some of their interactions took place on Skype which added another space for research and experimentation. Kaitlin developed a website to house her research findings and to serve as a resource for homeschoolers and early childhood educators. The site is full of great photos of her daughter at work/play, book recommendations and related lesson plans for projects that go beyond crayons and coloring pages. The books are specifically about art, though Kaitlin also shares my understanding and passion for picturebooks that are art objects and recognition that, all too often, the two don’t overlap. In other words, picturebooks about art and artists are surprisingly not always artful. 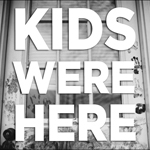 Please check out Kaitlin’s work and recommend it to your friends, fellow educators, and parents of young children. She plans to expand it after graduation and would love to hear from readers with feedback and recommendations for new books to explore. This post is dedicated to my friend Melissa, a partner in parenting and inspiration in all manner of creative and intentional living. Melissa and I met on a playground when our daughters, were just learning to walk. I felt an immediate connection to her, another East coast gal making a go of it in the midwest. Like me, Melissa came to Columbus for Ohio State. Her husband is a graduate student in the Art & Technology program and another person I am thrilled to have Cora spending time with. Andrew takes apart toys so he can mess around with their electronic guts. He builds 3D printers in his basement studio and prints things that contribute to, and alter, the world the girls’ play in. Case in point, the urinal he made for Maya’s dollhouse. Melissa can make anything out of felt. She sells her stuff on Etsy and gives the most beautiful gifts. Harboring not so warm-and-fuzzy memories of their own early educations, Melissa and Andrew plan to homeschool Maya, beginning with preschool. Since we do a childcare swap a few days a week, we’ve batted around the idea of doing this together. But I know that we have already begun. As I said, when Cora is at Maya’s house, she is learning all sorts of things from the handmade and repurposed stuff there. It’s like a museum with salon-style collections of images on the walls and shelves full of things collected and crafted over the years. The girls roam pretty freely, exploring how to get along and make their own fun and games. Our house feels a bit sterile by comparison. I like to hide most everything behind cabinet doors when it’s not in use and Dan and I, for all our love for and friends who are artists, don’t have a ton of stuff on the walls. I guess you could say we have a somewhat minimalist decorating style. But I’d like to think that what my home lacks in inherent inspiration I make up for through my interaction with the girls. Mind you, I also take advantage of their increasing ability to entertain themselves. (This past week while Maya was with us I got through the junk mail pile and cleaned the microwave!) But, when the opportunity arises, I’m starting to explore more intentional ways to push their learning, as I do when Cora and I are on our own. 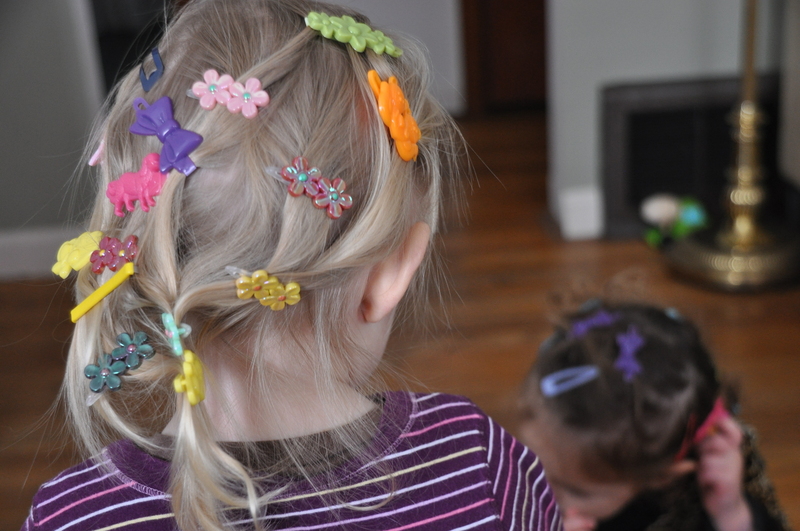 And so it was last week when the girls had me playing a hair styling game in which I adorned their heads with every barrette in Cora’s collection. They were disappointed once the supply exhausted, so I suggested we take them all out and do it again. As I took the barrettes out of Maya’s hair I was truly amazed by the size of the pile. 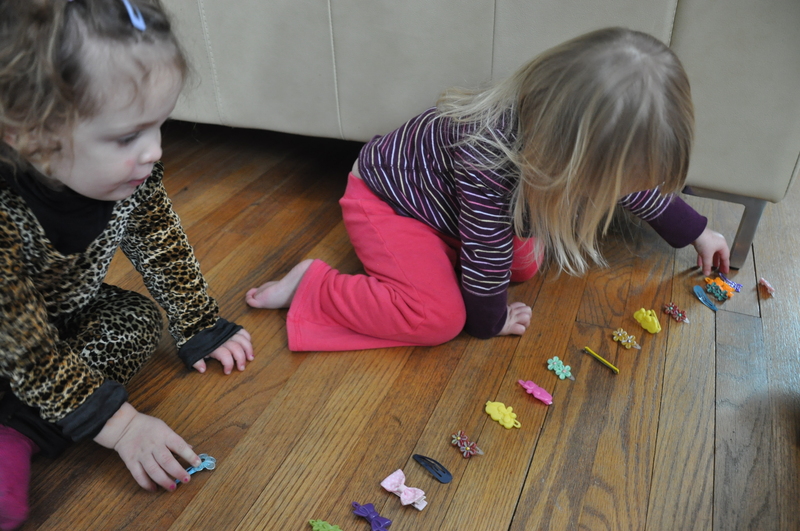 I said, “This is a lot of barrettes! I wonder how many there are here. Let’s line them up and count them.” And we did. The girls got a little lost in the counting after 12 or 13, but we made it all the way to 19. Then we did the same for Cora’s pile. Next we sorted everything by color. This activity wasn’t rocket science. But, it was grounded in a conscious desire to provide spontaneous frameworks for the girls to practice developmentally-appropriate skills. Next up, developing some real and mental lists of more things to work on so I can be prepared the next time a teachable moment arises. Recommendations welcome!